There are some DBZ minis, but they were part of a Shounen/Anime line with other series included. Game would be over if DBZ or MHA got their own line. I'd cry unless they were 1/12. With how popular the Pops are, I'm surprised they haven't made a Dragon Ball Z line (other than the few that were in the anime line). Or at least made an anime series 3 set. yokofox33 wrote: There are some DBZ minis, but they were part of a Shounen/Anime line with other series included. Game would be over if DBZ or MHA got their own line. I'd cry unless they were 1/12. Lol yeah it would be sweet to have a mystery mini of MHA, I really like the details the minis have to offer, I was thinking how cool it would be to see all the various characters they’d offer especially all might! These would be amazing and a great way to get some of the side characters. 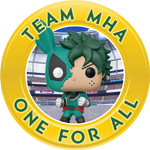 I wonder if there is some sort of licensing issue because I feel like Funko could make a toooon more MHA stuff and it would sell like crazy! I haven't watched MHA, but after seeing how popular it was at SDCC and how well the Pop versions sell, I'm also surprised they haven't pitched a line yet. bakivali wrote: With how popular the Pops are, I'm surprised they haven't made a Dragon Ball Z line (other than the few that were in the anime line). Or at least made an anime series 3 set. Same here. I'd really like for them to make an anime series 3 set. And/or MHA. I'm also still waiting on the One Piece minis.